This chain purse features a 16″ gold colored chain, showing an unique feel that is unrivaled. It has a top zip closure, lined interior provides plenty of room for your wallet, cell phone, make-ups, keys, sunglasses, and other daily necessities. Made from high-grade synthetic fabric. Removable 16″golden colored chain with lobster clasps at both side. Approx. dimension: 7.1″(L) x 0.98″(W) x 5.1″(H) inches. This chain purse features a 16″ golden colored chain, showing an unique feel that is unrivaled. 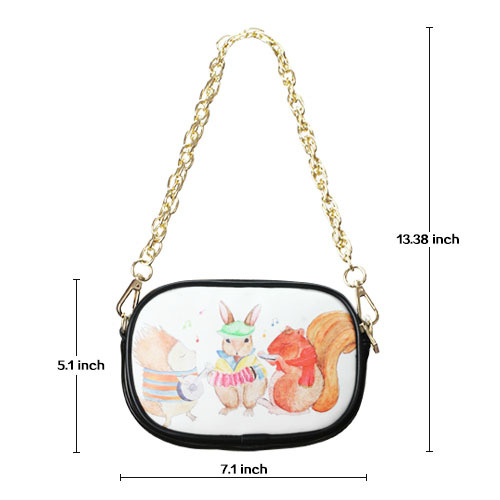 It has a top zip closure, lined interior provides plenty of room for your wallet, cell phone, make-ups, keys, sunglasses, and other daily necessities. This dainty, customizable under the arm purse is perfect for your special little girls who like to carry their personal items around. 4. Removable 16″golden colored chain with lobster clasps at both side. 5. Approx. dimension: 7.1″(L) x 0.98″(W) x 5.1″(H) inches. * Approx. dimension: 7.1″(L) x 0.98″(W) x 5.1″(H). * Removable 16″ golden colored chain with lobster clasps at both side. * Designer Tip: To ensure the highest quality print, please note that this product’s recommended uploaded image size in pixels (W x H): 2248 x 1540 or higher.